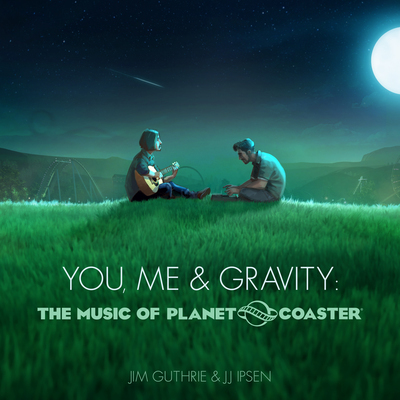 Jim Guthrie & JJ Ipsen present You, Me & Gravity: The Music of Planet Coaster, a new soundtrack available Thursday, November 17. Listen to the album's debut offering, "Aspect Imaginarium," HERE or below. LISTEN: Jim Guthrie & JJ Ipsen - "Aspect Imaginarium"
The whimsically optimistic yet contemplative music of Jim Guthrie often captures the mystery and majesty of life in relatable, universal terms. Along with collaborator JJ Ipsen, he’s taken his instrumental prowess to another level with the emotionally impactful folk and rock 16-song soundtrack for the construction and management simulation video game, Planet Coaster. Even as pacing and tempos shift from driving pop pieces to gentle shuffles, there’s a persistent upbeat and positive vibe throughout these songs. Known in some circles as a thoughtful, gifted lyricist and singer, Guthrie’s musicianship is what really pushes his compositions into uncharted and exhilarating territory. His vividness as an instrumentalist has made him an in-demand and award-winning composer who has complemented films, commercials, and video games (including Sword and Sworcery and Below) with perfect scores and soundtracks. When striking images are paired with Guthrie’s musical sensibilities, they work hand-in-hand to convey a unified sentiment, idea, or feeling. When "The Light in Us All" begins, for example, its progression and whistled melody sounds like the launch for a campaign in support of happiness. It’s smart enough to enchance a purposeful march while striking deeply felt emotional notes within its recipient. Compare that to the relatively off-kilter and dramatic "Aspect Imaginarium," with its compelling time signature, horn sections, and skittering, layered guitars and piano parts, and you’ll find yourself touched by the warmest kind of high art. It’s fitting that Guthrie and Ipsen’s collaboration is for You, Me & Gravity: The Music Of Planet Coaster, the soundtrack for a game in which players build their own theme parks. The music they’ve conjured is imaginative, encouraging, and airy enough to alter the creative temperaments of those looking for inspiration. This music feels like it could be from an idealized future where Paul Simon and Jim O’Rourke live forever, composing inventive and heartening melodies that bolster the human spirit. Be inspired and inspire others as you create, manage, and share the world’s greatest coaster parks with friends and content creators around the world. Surprise, delight and thrill your guests as you build your coaster park empire, and let your imagination run wild with the future of coaster park simulation games. Learn more HERE.